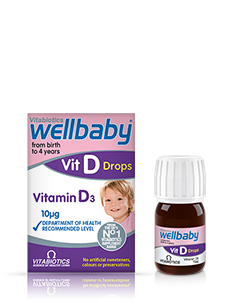 Wellbaby Multi-vitamin Drops contains 30ml per bottle, enough for 30 days at the recommended of 0.5ml/ taken twice daily. Babies (from 4 months up to 12 months): 0.5 ml (marked on the syringe) twice per day. If desired Wellbaby Multi-vitamin Drops may be given immediately before feeding so any residual liquid is washed off teeth and gums. Wellbaby Multi-vitamin Drops has no known side-effects when taken as directed. Do not exceed the recommended daily intake. In case of overdose, seek medical advice immediately. As with all supplementation, seek professional advice before using if your child is under medical supervision or suffers from any food allergies. Yes. 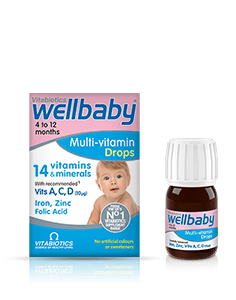 Wellbaby Multi-vitamin Drops is suitable for vegetarians. No. 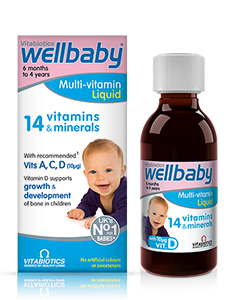 Like all products in the Vitabiotics range Wellbaby Multi-vitamin Drops has not been tested on animals.